We offer complete farm management for the agricultural investor, specializing in permanent plantings such as citrus, grapes, nuts and deciduous tree fruit. Our experienced staff provides "turn key" service for your farm. 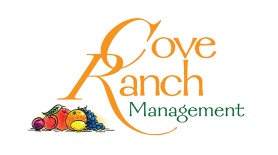 Cove Ranch Management was founded in 1975 by Phil Bertelsen. The company is now owned and operated by Phil's son, Brian Bertelsen. Brian has been directly involved in the business since 1986 providing overall management direction, owning and operating our sister company Primavera Ag Services, plus his involvement with farm real estate brokerage since 1987. Brian took over all operations upon the passing of Phil Bertelsen in 1996. We have grown steadily since our inception, offering a wide variety of services for agricultural investors, packing houses, area farmers and financial institutions. The main key of our success has been an experienced staff of professionals with lifelong experience in Central California agriculture. Our large inventory of equipment and experienced labor crews enable us to provide our clients with virtually any needed service. Our staff is committed to one goal: to efficiently manage your investment to its fullest potential. While our staff has a broad farming background, we have the most experience and prefer to specialize in permanent plantings commonly found in the San Joaquin Valley. Our current crops include citrus, wine and raisin grapes, almonds, and deciduous tree fruit. We work with a variety of area packers, shippers and processors to effectively pack and market our growers' crops to their specifications. As an agricultural property owner, you can choose to leave all of the daily decisions to us. We will provide management services for your farm and you will be kept informed through regular reports. You will receive detailed records of all work performed on your farm. Our staff will always base its management decisions on your personal goals and objectives. Any unusual expenditure or capital investment will always have the prior approval of the property owner. Some farm owners prefer to have some direct input on the activities on their property which is always encouraged. We will offer our advice and perspective, but the property owners, if they desire, can always have the last word! As part of our farm management package, we can serve as your representative to the packer and marketer of your choice. Since we do not own or operate our own packing house, we have been able to establish good working relationships with many area produce handlers. Management is our only business. As a Cove Ranch Management grower, you can be assured that your crop is being closely monitored until it is shipped. Primavera Ag Services is our sister corporation that provides contract labor services to our management clients as well as local, independent growers and packing houses. We maintain a large labor force to provide our clients with quality harvesting, pruning and thinning crews. We are fully licensed and bonded and comply with the ever-changing labor laws. Our experienced fieldmen provide crew supervision to meet your exacting standards. We can provide expert advice on the development of an orchard or vineyard, even down to the selection of the right piece of property on which the planting will take place. We work with a variety of industry experts to make sure that our knowledge base and expertise is the up to date and efficient, translating into the best opportunity to maximize profits.